Specter Oligospheres were conceived for the creative, the professional, the scholar, and the aspiring. Their functionality inspires relaxation, their innovation inspires creativity, and their refinement inspires focus. During the Ming Dynasty (1368-1644), a blacksmith forged two iron spheres for the Emperor of China. These gifts were to be used solely by the royal family to balance Qi* (chi). Soon, the public gained access, and stress balls were born. Nearly a thousand years of thought stimulation, increased blood circulation, improved brain function, and stress relief followed. *Qi is thought to be the ‘air’ or the energy coursing inside of you. It’s the underlying bases for Chinese medicine and martial arts. Keeping it balanced is the key to living a healthy productive life. Our goal is to revive this ancient tool with modern design to provide a solution to modern problems. As you progress, try rotating the spheres without touching. This is where you truly find balance. "It’s something you have to try to understand. Before trying it I didn’t think these would do anything." "They're beautiful just sitting there and I love playing them on while they're sitting on their stand." "I'm constantly working or studying and getting into the habit of using these acted as my reminder to take a breather, clear my mind, and balance myself." "I've been using them for two weeks now and I can confidently say I am more in tune with my body. I feel less stressed and surprisingly more productive." At Specter Co., we didn’t just want to create a tool. We believe design must embody purpose. Simply displaying Oligospheres instills relaxation, balance, and endless ambition. We spent countless sleepless nights just pouring over the design. We set out to make something breathtaking but also functional; something with depth that could grow with the user. Design must encompass a philosophy. Specter Oligospheres represent relaxation and progress. Whether they are being used or are simply on display, they are meant to act as your anchor of tranquility. Larger diameters are difficult to handle, especially with small hands. Specter Oligospheres are meant to be enjoyed by everyone. Our 40mm size is the perfect starting point for any user. With people spend more time typing, risk of carpal tunnel syndrome is rising. We chose to make a heavy set of spheres to combat this by exercising the muscles in the hand. While heavier spheres can be more fatiguing and difficult to handle, the small size should make them friendly to all types of users. It also makes the sphere much more durable. As you grow, your Oligospheres grow with you. Every SPECTER Oligosphere is made the same. Each sphere is hand polished until it is has just the right sheen. However, as soon as you remove the Oligosphere from its packaging, it will become one of a kind. As you rotate the spheres, you will imprint your own marks upon them, making your Oligospheres unique to you. The brass spheres will attain a unique tarnish over time. If you would like to reset, salt and vinegar baths will restore your Oligospheres to a polished shine. We spent months looking for the right people to help us make our brain baby. We wanted to work with a company that values quality and longevity as much as we do. Those who will check and check again that the product comes out precisely as we designed and will last a lifetime. We are relieved to say we found our match. It was not only their extensive knowledge or experience that won us over, but also their attention to detail and quality assurance system. We will work closely with them to ensure that each sphere can be held with confidence and pride. Our shared passion for quality gives us confidence that we will provide a product that will impress and last a lifetime. We have multiple stages of quality checks. 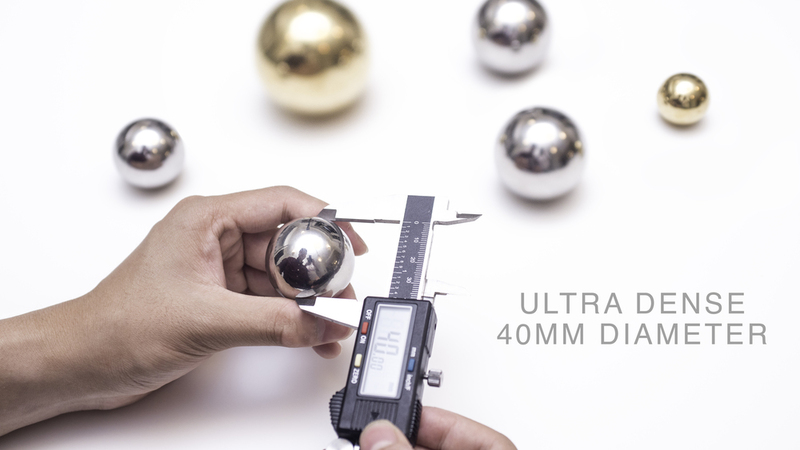 After each sphere is shaped, it goes through automated checking for whether or not it is perfectly spherical, if it has any nicks or dents, and if it’s ready for polishing. It is polished and buffed, then sent to a quality check team for careful inspection before hand packaging. We've spent countless countless days and nights testing and refining the Oligospheres. Our manufacturers are lined up and ready for production and our team is eager to quality check and ship each and every sphere. Your support will help fund the first production run and get the Oligospheres from our office onto your desk! The funding will assist with the cost of tooling, manufacturing, distribution, and capital for future projects. In order to bring Specter Oligospheres to life, we need your support. By not only backing our project, but also sharing it with your friends and family, you will ensure our success. We truly believe that Oligospheres have the capability to benefit the lives of anyone who is willing to give them a shot. Something as simple as tweeting about our page or sharing our Facebook page will go a long way to the success of Oligospheres. Thank you! We'll get back to you in a timely manner!